Two Santa Rosa institutions are celebrating major anniversaries this month, and they've joined forces to celebrate. Radio station KSRO 1350-AM marks 80 years. At one time it was the only radio station between San Francisco and Portland, Ore. Santa Rosa's Flamingo Conference Resort & Spa isn't as long in the tooth, but this month it's marking 60 years of stylish accommodations and relaxation. Fun fact: When the Flamingo opened in 1957, KSRO began broadcasting from the hotel. To mark the double birthday party, Steve Jaxon's The Drive on KSRO will broadcast live from the Flamingo on Sept. 27, 3–6pm—we'll be there, too, at 4pm for the "Boho Buzz". 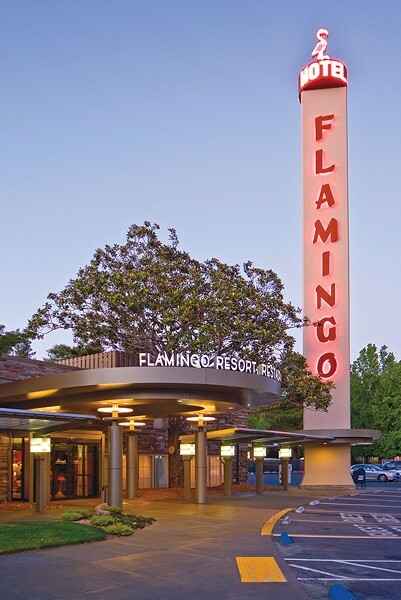 During the celebrations, which will feature live flamingo's from Safari West and synchronized swimmers from Redwood Empire Synchro, Flamingo staffers will open the 20-year-old time capsule tucked under the hotel's signature spinning flamingo. What will they find? George H. W. Bush memorabilia? Backstreet Boys LPs? A Nokia flip-phone? The event is closed to the public, but you can tune in to find out and listen in on the celebration.